You all remember the fact that at the 2014 Oscars, John Travolta made a big splash with his infamous introduction of "Adela Dazeem" aka Idina Menzel, the celebrated Broadway star known for her roles in Wicked and Frozen. Apparently humiliating himself once wasn't enough for Mr. Travolta, 'cause he's back with a vengeance at the 2015 Academy Awards, turning heads and embarrassing himself right and left. With Travolta's strange interaction with Scarlett Johansson, he might just be securing his status as the Kanye West of the Academy Awards. From dubious fashion choices to unwanted intimate gestures, Travolta is clearly not coping well with being out of the spotlight this year and he's itching to get the attention back on him. Travolta couldn't even wait til the ceremony started; he was responsible for what might be the most cringe-worthy moment of the Oscars thus-far at the red carpet pre-show. With the exception of Patricia Arquette's epic feminist acceptance speech, Travolta's shenanigans just might be the most entertaining part of tonight's pretty boring Oscars ceremony. Though it comes at the expense of others (sorry, Scarlett Johansson and Idina Menzel), Travolta's mission to steal the spotlight again is a source of endless entertainment for all . In case you missed these lovely Travolta moments, check out all his shining attempts to steal the thunder from the people actually winning Oscars. Just in case anyone forgot, Travolta mispronounced Menzel's name last year. Travolta reminded us this by calling attention to it oh, about fifteen times when he presented the Oscar for Best Song alongside Menzel. Travolta creepily fondled Menzel's face as he proudly patted himself on the back for saying her name right. 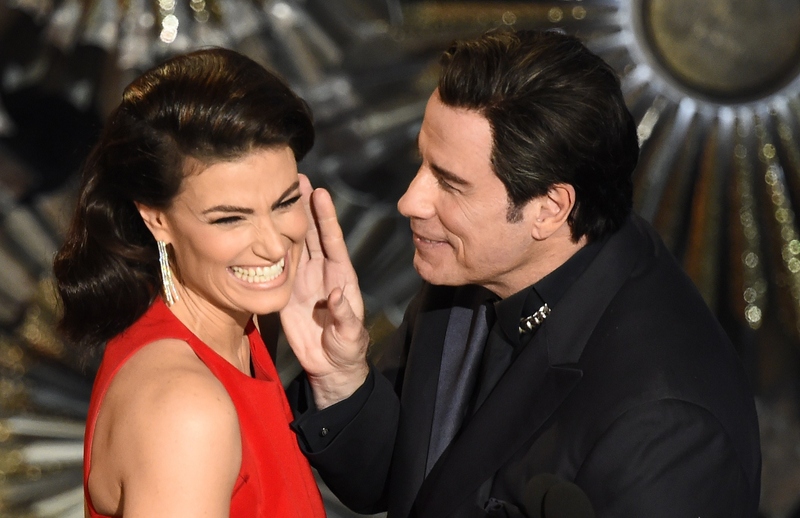 Travolta was all, "Hey guys, it's Idina Menzel! I said it right this time! 'Cause I pronounced it wrong last year LOL, Get it? I'm so silly." I'm no fashion expert so I am hesitant to judge the fashion choices at the Oscars. HOWEVER, I do have eyes and some common sense so I am able to discern that John Travolta's chain necklace & tux combo was a no-go. In a horrifying and hilarious moment during the pre-show red carpet event, John Travolta seriously misread some body language from Scarlett Johansson and leaned in for a big smooch, much to ScarJo's chagrin. Johansson threw him some mad side eye and got the heck out of dodge before he could creepily rub her belly anymore. Apparently Travolta is losing his way with the ladies. Yikes. This hilarious photo of Travolta smirking mischievously at Benedict Cumberbatch spread like wildfire, contributing to the many other meme-worthy Travolta moments of the evening. At least he kept us thoroughly entertained tonight with all his creepy antics?